We love walking and hiking in the Dolomites on our own vacations, and have offered walking tours in the Dolomites for many years. Our many years of experience walking in the Dolomites has allowed us to scout out the most scenic hikes in the Dolomites and we include the walks with the best views in our Dolomite walking tours and hiking tours. The Tre Cime – Three Peaks – di Lavaredo, are some of the most photographed mountains of the Dolomites, and the surrounding walking trails offer beautiful hikes. However, since this spectacular area is served by a good road and offers some easy walks, it can get packed with hikers. 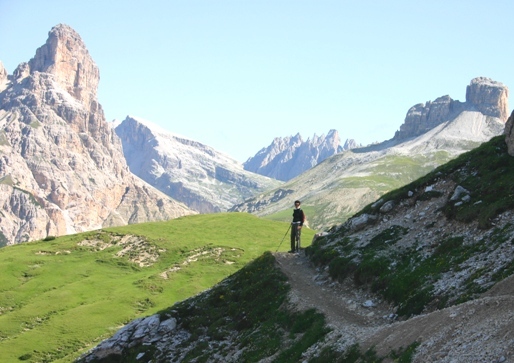 Here’s how to enjoy one of the best walks in the Dolomites without the crowds along a medium difficulty trail with great views. Start early in the day before the crowds arrive, and you’ll be done your hike before the frequent afternoon thunderstorms. Avoid Sundays, when the Tre Cime di Lavaredo area is overrun, though the people watching is astonishing: loud families with wild kids, super-fit climbers, pudgy walkers gasping for air, young Italian couples in tight jeans and high heels, and hoards of nuns in hiking boots. All rather amusing but hardly peaceful. We usually drive up to the Tre Cime’s vast parking area (and paid the 20 euro per car toll/entrance fee), but there is bus service from Cortina, too, though infrequent, so you have less flexibility than driving. Once you have found a parking place in the large parking area (if it is early in the day, turn right at the first parking area by the Rifugio Auronzo to find a space), and then you can stop for a coffee at the Rifugio Auronzo before setting off on this loop walk around the 3 Cime di Lavaredo. Walk to the end of the lower parking areas, and take the #105 trail (this overlaps with part of the Alta Via #4, one of the Dolomites High Routes long distance trails). Follow this trail all the way to the Rifugio Locatelli, which will take about 2- 2 1/2 hours. If you start early in the day (by 9.30 am), you will see almost no one on this trail and can enjoy the scenery in blissful solitude. Note the wildflowers, especially the yellow alpine poppies that favor this rugged rocky terrain. There is some steep up and down along the trail, but if done slowly, it is not difficult. Along the way, you will pass some tiny lakes surrounded by wild rhododendron, and a malga, an alpine dairy farm, which may be serving cool glasses of fresh milk. The Rifugio Locatelli is at an intersection of several trails, so it is often chaotic with wild-haired climbers and sweaty hikers. Welcome back to civilization…. At least you can enjoy a pit stop and refuel with Dolomitic portions of chocolate cake and apple strudel! You now follow the main wide trail #101 with breathtaking views and a bit of a climb up to the small pass that offers the best views of the 3 Cime as well as alpine climbers on the north face. (Above you there is a parallel narrow trail from a WW I battlefield, where there is a via ferrata, a trail equipped with fixed cables, but you should keep to the main walking trail). 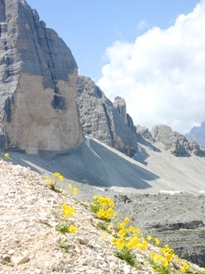 You’ll get to the Rifugio Lavaredo in about 90 minutes, which is a good place for lunch. A hearty plate of polenta with goulash spiced with juniper berries is a traditional dish in this part of Italy, and will taste oh-so-good after your Dolomites walking tour. After the Rifugio Lavaredo you will no doubt find lots of walkers, but it hardly matters at this point because you have had such a great walk. It takes another 20-30 minutes of flat walking to reach the parking area of the Rifugio Auronzo where you started. You will have seen an impressive number of Dolomite peaks along the way- the Cristallo, Sorapiss, Croda Rossa – as well as the beautiful blue lake of Misurina. Now you know why this is one of the most spectacular walks in the Dolomites, if not all of Italy! We are based in Cortina when we do the this walk on our Wildlflowers in the Dolomites walking tour, where we stay in the historic Hotel Ancora in downtown Cortina, or if you want to be utterly pampered in a luxurious spa hotel, the Hotel Cristallo Palace a few kilometers up the hill with a shuttle service into town. We can also organize a private family trip in the Dolomites with lots of activities for youngsters and adults alike. Choose your preferred type of accommodation, from luxury spa hotels to cozy welcoming farmstays, we can customize a private walking tour in the Dolomites that will please everyone in your family or group of friends. 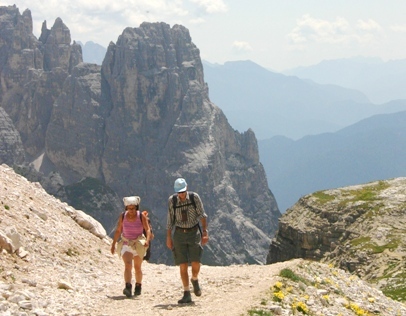 Often families need to travel in summer, when Italian cities can be uncomfortably hot and the beaches overcrowded, so the Dolomites are an ideal summer destination for a family’s private walking tour. Glad to hear it, Bram. Have a great hike! I have never tried to walk this in winter, and since it is at about 8000 ft altitude, expect a lot of snow or bring your skis! We are planning to walk in the dolomites in the middle of august. We will arrive Hotel Tre Cime in the afternoon and we are planning to go to Rifugio Sennes the first day, but now I also want to take the walk you discribed around Drei Zinnen. Do you know when we can start the walk at the latest ? Will it take about 3 hours? Awesome info, I was hoping to be able to see the best of the Dolomites in a short time frame, as in 2 or so days (Not ideal, but this day in age, a short time is better than no time). I think the Tre Cime can be done as a day hike? Is this correct? Also, the best city to stay in for a day trip to do this hike would be where? Cortina? One more question. I will be coming up to the Dolomites from Venice. What would be the best way of getting there from Venice? 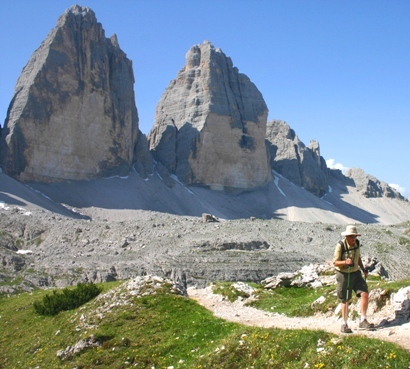 Pete- Yes, the Tre Cime can be done as a day hike – I have usually been based in Cortina becuase there are so many hikes near by, and there is bus service to the Tre Cime. There is infrequent bus service to Cortina from Venice. You can catch a train from Venice to a town called Calalzo de Cadore and then connect to a bus to cortina. The train takes 2 hrs if you get a direct one…there are a couple of direct services most days, or other trains take about 3 hrs with a connecting change or two. The bus to cortina from Calalzo then takes one hour and runs every hour. I know this because I have come this way today to Cortina. We previously did this walk in July of 2008 & would like to return in April 2014. Is it accessible or still snow covered at this time of year? Thank you for your easy-to-imagine description. My girlfriend and I will visit next week. We will be bringing a smaller dog, so my question is if which trails are more suited for dogs? Also, if there are other issues we should think of concerning the dog. Thank you for your webpage. My wife and I are doing the Alta Via 1 near the beginning of what could be about three weeks of hiking in the beautiful Dolomites. I’m wondering whether there is something more than a day hike but perhaps something less than the classic Alta Via 2 hike that we could plan, say maybe a 3-4 day hike, planning on using the rifugios each night. Chances are that we would be heading to Cortina from Belluno, although not necessarily if there is something worth doing in between. Grazie! Thank you for your webpage. My wife and I are doing the Alta Via 1 near the beginning of what could be about three weeks of hiking in the beautiful Dolomites. I\\\’m wondering whether there is something more than a day hike but perhaps something less than the classic Alta Via 2 hike that we could plan, say maybe a 3-4 day hike, planning on using the rifugios each night. Chances are that we would be heading to Cortina from Belluno, although not necessarily if there is something worth doing in between. Grazie! We will be in Cortina April 28 and 29. Will the toll road be in operation then? f not, is there another way to access the trail? We (husband, myself and our dogs) will be visiting the Dolomites for the 4th year in a row this September! The Three Peaks is always favorite on the agenda and we usually do it twice per vacation! It is a fantastic walk, long enough to have a ‘good day out’ but not too long. Also absolutely perfect for dogs (we have a labrador and golden retriever) – there are usually several little lakes where they can have a dip and/or drink en route as well. My boyfriend and I will be going to Cortina in Mid April. Is this trail recommended during that time? Do you think hiking or snowshoeing would be possible? You will find that many hotels and other places are closed in mid-April, and I am not sure that the road to the Tre Cime is open; even if it is, expect snow on the trail!